Of course, as we argue in our Inquiry, Why Libraries Will Shape the Future, the purpose of libraries and librarians—to disseminate information—is more relevant than ever in the internet age. But what of the physical spaces, which Mark Twain called “the most enduring of memorials, the trustiest monument for the preservation of an event or a name or an affection; for it, and it only, is respected by wars and revolutions, and survives them?” Will these institutions that once helped define communities still exist? And why should they? In advance of “Do Libraries Have a Future?” a Zócalo Public Square event in partnership with WeHo Reads, we asked eight writers to reflect on the most memorable library they ever visited, what it meant to them, and whether it should exist in 100 years. When I was a kid growing up in Brookline, Massachusetts, I spent many weekend hours on my own in the Coolidge Corner Public Library. I must have been 10 when I was allowed to take the streetcar to the library by myself. At first I had to stay in the children’s library, a room on the ground floor where I systematically read my way around the shelves from A to Z. I remember the Dr. Doolittle books, the Andrew Lang collections of fairy tales titled with colors, and my first great literary discovery, Robert Heinlein’s Red Planet. I read them all many times. But then I figured out how to sneak into the adult library, or rather a part of it—a room on the third floor (the library was in an old Victorian house) where almost no one went, especially not the stern librarian. The books on the third floor were an odd assortment: handbooks on games and sports, some biographies, and, thrillingly, humor. There I found parodies by the Canadian writer Stephen Leacock, send-ups of obscure novels and forgotten memoirs I had never heard of. The parodies were very funny, and there I sat in a comfortable armchair and read and laughed on winter afternoons until the sun went down and I had to go home. I have worked in great research libraries, and belonged to the historic London Library (which was frequented by Virginia Woolf). I’ve loved them all, but this first place, where I hid in a room full of books, was the most magical. I did not know then that its children’s reading room was the first one ever established in the United States. The Coolidge Corner Library is still there, rebuilt, expanded, and reimagined. I hope it has been a secret sanctuary for many other bookish little girls. 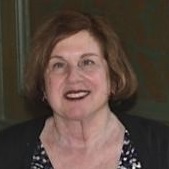 Elaine Showalter is Professor Emerita of English at Princeton University and the author of The Civil Wars of Julia Ward Howe. My memorable library exists only in 1976 above an insurance office in a small town in the woods of northern Maine. The children’s shelves lined the back wall, an adult section of mostly paperbacks bisected the room, and someone’s classical record collection perched on the front desk. There were stuffed chairs here and there for novel reading and a table upon which to open the newspaper. From the brown armchair you saw a river and, on the other side, a whole other country. This library will not exist in 100 years, as my little town shrinks and grays, some forests emptied of wood and others turned into national monuments. In 1975 my father, a logger, had broken his back and so my mother entered a jobs program, which placed her as a “Library Aide.” Thus, my shy mother was trained by Dora K. Soucy. A handsome woman, Mrs. Soucy was impossibly from Switzerland, with chignon and red lips, convertible car, and pretensions. She has not existed for years. In that long-ago winter of my twelfth year I read anything, barreling through very limited choices with a thoroughness that only hours of boredom could stimulate. I read Sydney Sheldon, Helter Skelter, and a book about soccer players whose plane crashed in the Andes—the months of deprivation required that they eat their dead. After school, I walked to the library and read for hours, a convalescence of sorts. I was voracious for any story about terrible things in other parts of the world, tales of how some survived, how others were punished. Rarely did anyone else visit the library at that time and it was dark when we left, Dora K. Soucy returning us home to my father or a sitter, to the younger children, and whatever supper my mother could find. 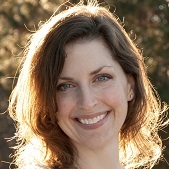 Connie Voisine writes and teaches in New Mexico. Her poetry has been published in The New Yorker, Poetry magazine, and other publications. Her most recent book is Calle Florista. Beginning in early adolescence, and for reasons that are still not entirely clear to me, I was attracted to tales of the macabre and started scribbling my own little stories in the style of Poe, Hawthorne, Lovecraft, and King. My best friend shared my peculiar interest in dripping catacombs and chthonic monstrosities, and one day his father arranged to take us downtown to the Cleveland Public Library to a see a book rumored to be bound in human skin. The book was housed in the Special Collections department, an enormous reading room underwritten by John G. White, an eminent Cleveland attorney and bibliophile who “conducted a determined quest, throughout the world, for desirable additions” to the library. A boon to any budding magus, occult scholar, or nerdy adolescent boy, the room boasted thousands of rare volumes on magic and witchcraft, including a 1768 work on vampires. It also contained one of the nation’s largest collections of folklore, as well as rare manuals on chess and checkers. To enter the room a patron had to demonstrate that he was a researcher, and then sign a consent form. Though my pal and I had yet to embark on our future careers as writers, we were granted access to the room (his father happened to be very chummy with one of the trustees), and we spent a rainy autumn afternoon poring over the dusty tomes. We were not, however, granted access to that notorious book bound in human flesh. “It’s too delicate,” the librarian explained, “and in danger of falling to pieces.” I thought this an apt way of describing such a morbid artifact. She informed us that anthropodermic bibliopegy, or the practice of binding texts in human skin, had a curious history dating back to at least the Middle Ages when paupers sold their bodies to medical schools and their skins to binders. In this particular instance, the book’s original owner wanted to immortalize himself by arranging to have his own skin used after his death. 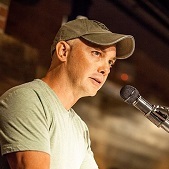 Kevin P. Keating is the author of The Captive Condition and The Natural Order of Things, a finalist for the Los Angeles Book Prizes/First Fiction Award. He teaches at John Carroll University near Cleveland, Ohio. The most memorable library I have ever encountered is not one that is particularly lovely or atmospheric, but is rather ingrained as a step into adulthood, one both expansive and insular. It is the library at the boarding school I attended in Connecticut, Choate Rosemary Hall. Choate was a fantasy-land for me. I loved it unequivocally, and remain extremely proud of having attended such a wonderful place, so rich in history and illustrious graduates. It was the first time I lived away from home, the first time I “took care” of myself (though it was a moderate, supervised version of living on one’s own, of course), and the first time that I had to be my own driving force to do work—no one was looking over my shoulder, urging me along. This was empowering. I associate the Choate library with pajamas—my library time was from 7:30 to 9:30 p.m., “study hours” as they were called. I would set off from my dorm room (one once occupied by John F. Kennedy), wearing my plaid pajamas, a polar fleece, and slippers, traipsing across campus to the firefly warmth of yellow light pouring out of the oversized faux-Georgian library windows. I would walk past oiled wood floors, elegantly worn carpets, oil paintings, and ignored tomes, and find a desk or carrel in which to camp out. But I would also glance around for friends, or a girl I liked, and might head to the basement, where those went who were more interested in chatting across a table of open books than actually reading them. This was my first taste of independence, but it was crossed with a year-long, 24-hour-a-day slumber party, pajamas and all. It would be my choice to set off for the library during study hours. I’d do what I wanted there—studying was not necessarily high on the list. I might pop upstairs to the dorm above the library to visit a friend, or sneak off to the soda machine down the hall, or just sit on the library steps and wonder at how lucky I was to be part of a high school that I consider the very best that one could attend, part of such a rich tradition that my pride in having been a part of it tops all that I have accomplished since. Noah Charney is a professor of art history and best-selling author of, most recently, The Art of Forgery, and Art Crime: Terrorists, Tomb Raiders, Forgers and Thieves. I’ll never forget the library at Oberlin College. According to its website, it’s “located in The Seely G. Mudd Center” on campus, but to students (or at least those of us who attended from 1998 to 2002), it was known simply as Mudd. I can still conjure the long concrete ramp to its entrance, and the dark stairwell, and the message board of questions that students scribbled on little slips of paper for Ray English, the head librarian, to answer in his amusing—and sometimes bemused—tone. Mudd is decorated like Don Draper’s late-season Manhattan apartment, with low multi-colored couches, even womb chairs, but that’s not what stands out in my memory. I mostly recall moments of reading and writing in the study carrels—it was in one of those carrels that I read CivilWarLand in Bad Decline by George Saunders for the first time, and Judith Butler’s Gender Trouble, my brain humming. What I also remember is the community that Mudd engendered. Back then the computer lab was in the library’s basement, known as A-Level, and it was there that my friends congregated most weekday evenings to study, work on papers, check email, and, of course, procrastinate. I miss A-Level: the bustling computer lab, the molded plastic chairs in the antechamber separating the lab from the quiet study room, even the bad lighting. More than anything, I miss the conversations that happened there. A-Level is no longer the go-to hang out for Obies, but the library is still a place for them to congregate. I hope it always will be. Libraries provide opportunity for moments of connection—with a book, with another person—and that will remain essential. 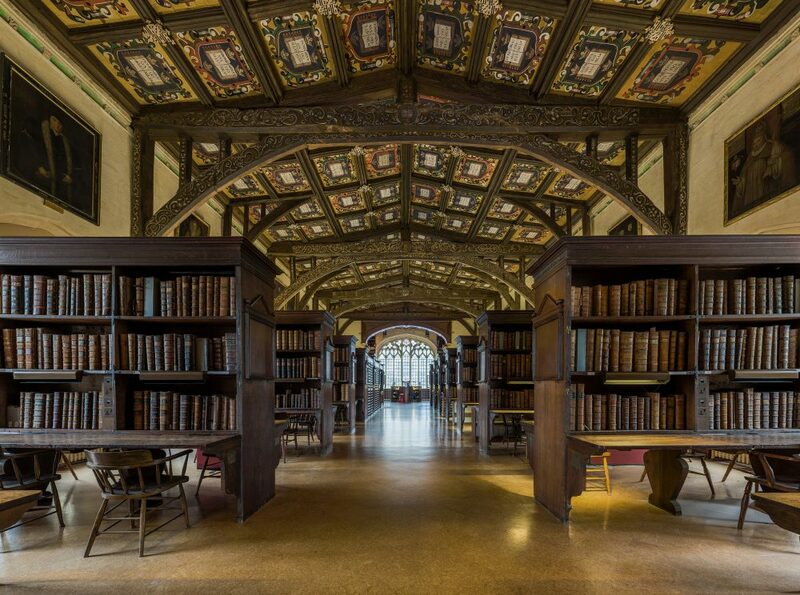 The Bodleian Library at Oxford used to fill me with rage. I was an English Lit graduate student, fresh from my Canadian B.A., and used to finding books easily. The Bod, as everyone called it, is a gorgeous monster, a Medieval building with doors you cracked your head on, dips in the stairs, and miles of stacks below it, holding every book published in Britain. Stacks you couldn’t enter. The system involved looking up a call number, penciling it on a small green slip, and handing it over to the always-calm staff, who would go digging and bring up your requests after a while. Sometimes a half-hour, sometimes much longer. Apparently an attempt at computerization hadn’t worked, so they carried on as they had for centuries. I’d sit in the Upper Reading Room looking at the faces of greats painted on the walls, or at the high gridded ceiling, ignoring neighbors at the attached desks. Once I got my books, I had to scribble notes on paper, as there was nowhere to plug in my laptop (it was a power-sucking brick of a thing). This was also maddening. But it was the best thing for me, and my thesis. Waiting, and writing by hand, then typing up notes later at home cleaned up my ideas. The still atmosphere, the sense of ancientness, also slowed me right down. I miss the place all the time. I hope that in 100 years it’s still running the same way. 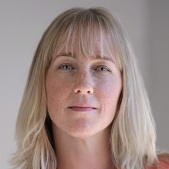 Alix Hawley is a writer living in British Columbia. 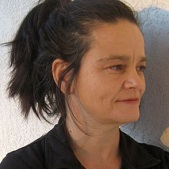 Her multiple prize-winning debut novel All True Not a Lie In It was released in Canada in 2015 and has recently been published in the United States. The State Library of Berlin is filled with angels. Wim Wenders revealed this secret under the guise of fiction in his 1987 film, The Wings of Desire. In it, otherworldly beings wearing stern trench coats and blank expressions listen to library users’ thoughts, gently leaning over them as they read and write. They are comforting and terrifying at once: they could be spies or muses, guides to art or nurses of death. The mortals beside and beneath them translate Hebrew and write epics of war and peace. I wrote much of my dissertation on Anglo-Saxon literature in the State Library, nicknamed “StaBi.” I was spending summers in Berlin, and Hans Scharoun’s 1978 building at Potsdamer Platz became my lodestone, my home—a place where I seldom struggled to write. It is not an easy library to use: patrons have to register, there is an elaborate protocol for entering and leaving, most books are offsite and take hours or days to arrive, and a surprising number of volumes are marked in the catalogue as “Kriegsverlust möglich,” possibly lost during the war. These difficulties gave a feeling of ritual to entering the library. By the time I was in, I was despoiled of food, outerwear, and anything but what was most necessary for research. I always believed the angels were watching out for me, though it may have been the liberating grandeur of the architecture I really felt. The main reading room’s high ceilings gave my thoughts space to dance. Those thoughts floated down to my computer in what resembled, more or less, prose. The angels were definitely responsible for my computer never managing to connect to the wireless network over a decade of visits. I still thank them for that. In 100 years readers and writers will need the StaBi even more than I did. We tend to think of libraries as archives, bursting with information and objects, but the State Library of Berlin is also a place of absence and loss. To create good work it sometimes helps to be reminded of the fragile nature of knowledge, of language, and of our own bodies. By now, we have enough information. What we need are vast, empty spaces that invite us to fill them with words and ideas, spaces that offer us, if not immortality, a momentary touch of transcendence. 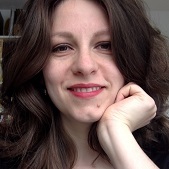 Irina Dumitrescu teaches medieval literature at the University of Bonn and writes about food, immigration, and dance. She is the editor of Rumba Under Fire: The Arts of Survival from West Point to Delhi, a collection of essays and poems on the humanities in times of crisis. The most memorable library I’ve ever visited was one I built on a whim. Actually, over a hundred people built it, many of them strangers to me and the students who checked out the books. In 2012, I taught at a high school in one of the poorest neighborhoods in South Los Angeles. The students didn’t read much but they had valid reasons. Their parents chose putting food on the table over buying books. A walk to the neighborhood library was too dangerous. Most tragic of all, our school did not have a library. So I put out a call for a book drive on my Facebook page. I had hoped for 100 books, but expected only 50. Then the boxes came. By the dozen. Daily. So many that eventually they had to be delivered on a dolly. Over the course of four months, more than 2,000 books were shipped to my classroom at 103rd and Broadway. They came from over 100 donors—80 percent of whom I did not know personally—and from as far away as Canada, Australia, and the U.K. I had to buy enough bookshelves to line the walls and then train student librarians to recommend, categorize, and re-shelve the books. I named it the Yen Thi Tran Memorial Library, after my mom who read to me regularly as a child. In addition to the hundreds of short stories my students wrote in my creative writing class, the highlight of my time there was seeing students walking around the school with works by Toni Morrison, Sherman Alexie, Tim O’Brien, and Arundhati Roy in their hands. Or when students would fight over who could check out a book first. Or when a popular student would leave the hustle of high school lunch and go off and read alone. The library is gone now, the books given to the students. Only a few hundred students even remember it ever existed. But that’s enough for me. 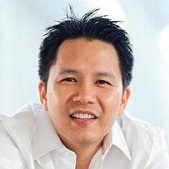 Ky-Phong Tran is a writer and teacher based in Southern California. 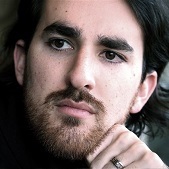 A graduate of UCLA and UC Riverside’s MFA Program, his work has appeared in the San Francisco Chronicle, the Huffington Post, and the Orange County Register. Primary Editor: Callie Enlow. Secondary Editor: Sophia Kercher. *Photo by Diliff - Own work, CC BY-SA 3.0/Wikimedia Commons.